The versatile and welcoming Kia Sportage features a spacious cabin, delivers a smooth ride, and has all the features you need to enjoy every drive. The latest edition of this compact SUV can be found here at Kia of Des Moines, where we’re proud to serve drivers from Des Moines, West Des Moines, and Ankeny. Whether it’s your first time here or you’re a returning customer, we’ll be happy to talk to you all about this exciting vehicle. The Sportage is engineered to be an exciting vehicle, ready to take on the smoothest of roads and the ones with all the bumps, too. There are a pair of 4-cylinder engines to choose from, the first being the 181-horsepower base edition. The LX and EX trims come standard with this engine. The SX Turbo model, however, gets a boost with the 2.0-liter turbocharged 4-cylinder, which produces 240 horsepower. As for those roads with the bumps, the Dynamax™ all-wheel-drive system is able to sense rockier roads and changing weather conditions. The electronic sensors work to monitor road conditions. If needed, power will be distributed to the proper wheels for better traction in wet or snowy conditions. The driver-focused interior starts off with the angled console, with displays and buttons organized in an easy-to-find manner for a streamlined driving experience. The Kia Sportage carries room for five passengers, with both rows of seats carrying enough space for even taller passengers. The 60/40 split-folding rear seats are certainly nice to have, allowing you to expand the cargo area while still having enough room for passengers. There’s 31 cu. ft. of cargo space when using all the seats, and around 60 cu. ft. with the rear seats folded. The soft-touch materials are comfortable and give the interior a welcoming feel. If you’re looking to set just the right temperature, dual-zone automatic climate control can do just that for those seated up front. Looking to let a little light in? The available panoramic sunroof will be able to do just that. 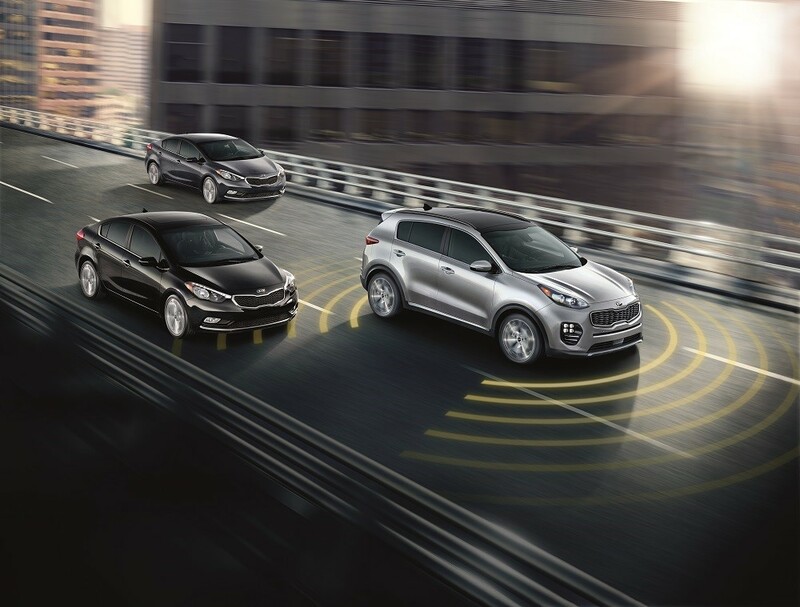 The state-of-the-art technology in the Kia Sportage is able to power driver assistance, infotainment, and convenience. We’ll begin by talking about the standard rearview camera, which lets you see what’s happening behind the Sportage when backing up. A 5-inch touchscreen comes standard, but upgrading to either the 7- or 8-inch screen may be a worthwhile venture. The available Apple CarPlay™ and Android Auto™ functionality are welcome additions, too. Send a text via voice command, check out your messages, or play music. All it takes is a few taps of the touchscreen, and you’ll be well on your way to making the Kia Sportage a rolling technological beast on wheels. Visit Kia of Des Moines, and see the 2019 Kia Sportage up close. This SUV is a joy to drive in Des Moines, West Des Moines, and Ankeny. Start the buying or leasing process off by filling out the finance application here on our website. And don’t forget to schedule your test drive with our experienced sales team!